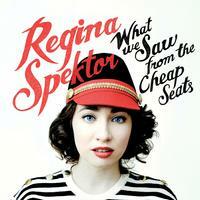 Pop songstress Regina Spektor dazzles with her sixth full-length recording, What We Saw From The Cheap Seats, an album that was captured over eight weeks in L.A. Spektor has enjoyed overwhelming praise for her quirky pop hits and Platinum selling releases. The album is a showcase of her immaculate songwriting talents and unparalleled musicianship. Anchored by her piano, Spektor fleshes out this fourteen-track masterpiece with a variety of instrumentation. Included is the funky “Small Town Moon” and the emotion provoking “How,” every track is a sonic accomplishment.